NHL News : Report: Sharks closing in on contract for Karlsson? Report: Sharks closing in on contract for Karlsson? Sharks GM Doug Wilson is NOT messing around this offseason! It’s been nearly a week since the Ottawa Senators pulled the trigger on the biggest trade in franchise history, shipping superstar captain Erik Karlsson to the San Jose Sharks in exchange for forward Chris Tierney, defenseman Dylan Demelo, prospect Josh Norris and a package of draft picks. Rumor has it that the Tampa Bay Lightning, Dallas Stars and Vegas Golden Knights were also in on Karlsson trade talks, but things fell apart when it became apparent that Karlsson was not interested in a sign and trade type scenario. 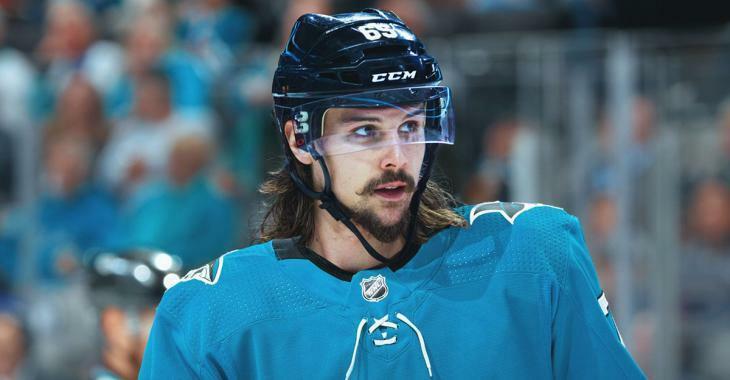 As it is, Karlsson is slated to hit the open market as an unrestricted free agent next offseason… that is unless he re-ups with the Sharks beforehand. For what it’s worth, Sharks general manager Doug Wilson has repeatedly said that he would not have traded for Karlsson if he didn’t think he could negotiate a long-term deal with him… so, time to put your money where your mouth is, Mr. Wilson. Get a deal done. This is nothing new for Wilson and the Sharks, of course. Wilson also pulled off another blockbuster deal at the 2018 NHL Trade Deadline by acquiring pending free agent Evander Kane from the Buffalo Sabres. Kane had an immediate impact with the Sharks and earned himself a nice seven year, $49 million deal shortly after the 2017-18 season. With Karlsson however, Wilson and the Sharks will have to dig deep. The Swedish blue liner has repeatedly stated that he’s looking for a deal that pays him top dollar, so expect him to use Los Angeles Kings defenseman Drew Doughty’s eight year, $88 million deal as a starting point. Doughty’s deal comes with an $11 million annual cap hit. “Look at the history. That’s all I can say,” Wilson said. “Jumbo [*Joe Thornton*], [Brent] Burns, [Evander] Kane, Jonesy [*Martin Jones*]. When you have the type of team we have, the type of team and the type of players, [knowing] what players are looking for, I think we fill all those boxes. The thing is… Karlsson is 28 years old and the Sharks already have veterans like Marc Edouard Vlasic and Brent Burns inked to long term deals on the blue line. Both Vlasic and Burns are on the wrong side of 30 and will be under contract until they’re nearly 40 years old… what’s the appetite for doing the same with Karlsson? Is there a hesitancy to sign Karlsson for eight years?